The race to find a competitive advantage in hockey is reaching unprecedented heights. One of those advantages is finding a reliable way to identify a player’s unique skill set. Once you know what a player’s strengths and weaknesses are, you can more efficiently maximize his strengths and insulate his weaknesses. Knowledge of a player’s skill set can help inform coaching decisions and lead to tangible results on the ice. The following discussion on the 1-3-1 Neutral Zone Forecheck provides an example of how this information can be used. 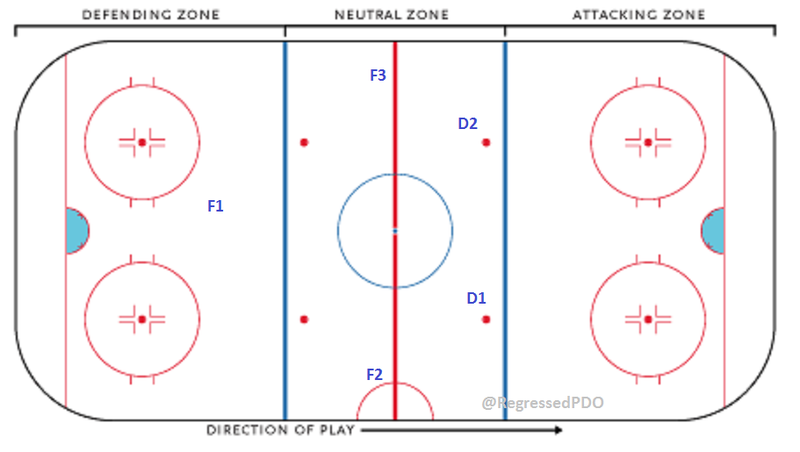 The Neutral Zone Forecheck is the name given to a variety of formations used to defend against the team’s opponent gaining the offensive zone. This is not to be confused with the Offensive Zone Forecheck, which is any number of formations used to regain possession of the puck after entering the offensive zone. F1 is the first line of defense. This is usually a forward who is a very agile skater and skilled at creating turnovers. F2 and F3 set up in the wide lanes. D1 and D2 position themselves nearly parallel to the faceoff dots on the neutral side of their own blue line. There are two options with the 1-3-1 for the D1 and D2 assignments. The first option allows the defensemen to make the decision as to which of them will move up to join the forwards thus creating the 1-3-1 formation. This is dependent upon which side of the ice the puck carrier is on. Obviously, exercising this option requires a lot of practice at reading the oncoming attack and clear communication between the defensemen. The second option is to decide in advance which defenseman will play up and which will drop back. There’s less opportunity for miscommunication with this method since everyone knows his assignment to begin with. F1’s responsibilities change a bit from many other NZ forecheck formations. F1 is often very limited in how far he is able to move around to pressure the breakout or regroup; however, in the 1-3-1 formation, F1 can pretty much do as he pleases so long as he is pressuring the puck carrier to make a poor or ill-advised pass. Below is an example of the movement allowed. F1 chases the puck carrier out from behind the net. The puck carrier can try to skate higher up in the zone to make a shorter pass, but he will do so under heavy pressure from F1, thus increasing the likelihood of a turnover. The puck carrier could also pass to a waiting forward. The illustration above shows the motion of the various players as the puck is moved higher up in the zone. The forward on the strong side, in our example, F3, moves up to pressure the puck carrier. D1 is the defenseman playing up in this formation. He will help pressure the entry by taking away any passes and taking up space in the middle of the ice. The forward on the other side, F2, will drop back a bit while continuing to take up space and disrupt the entry. 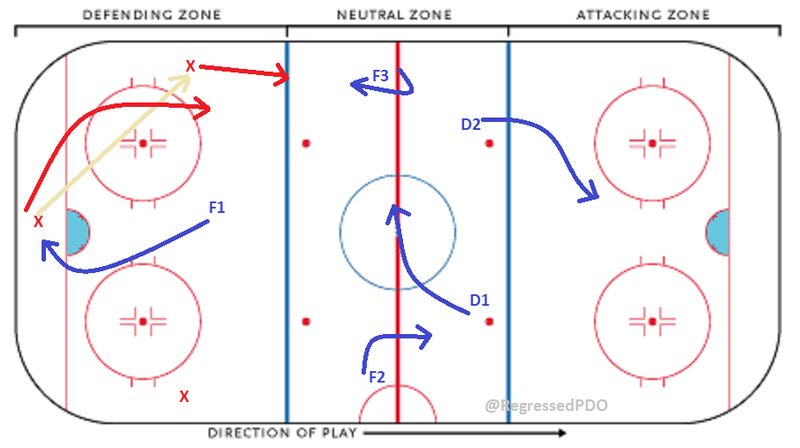 D2 will read the play as it advances and essentially hold down the fort in the defensive zone. Anything that gets through the neutral zone is his responsibility, at least initially. The point of this type of forecheck is to force the puck carrier to make a long pass since there is, ideally, no room to carry the puck through the neutral zone. Teams will often counter this by using a hard pass into the neutral zone that one of the waiting forwards will tip into the offensive zone. Essentially, this is a dump in type of zone entry, because the puck will shoot into the offensive zone will velocity and the attacking team will go into their forecheck formation to try to recover the puck. If teams use the second option in the 1-3-1, i.e. determining in advance which defenseman will play up and which one will drop back, there is a good opportunity to maximize the skill set of each of the defensemen. The defenseman playing up should be the player who is more crafty in using his positioning, skating and/or his stick to create turnovers when defending the zone entry. This is an excellent time to knock the puck loose, because the defending team has at least three players in the neutral zone that can try to recover the puck and go on the attack. The defenseman playing back should be the player who is the more skilled passer of the pairing. If the puck gets dumped into the offensive zone, he obviously has the first opportunity to get to it. Once he has the puck on his stick, he can read the coverage and make a good pass to targets high in his defensive zone or in the neutral zone. The more accurate his pass, the more likely his team will be able to go on the offensive attack. Using the more fluid option of having the defensemen switch up who is playing where diminishes the ability to maximize the individual skill sets of the defensemen. Even at the NHL level, it is not likely that each defensive pairing is comprised of players equally skilled at breaking up entries by creating turnovers with their sticks, skating, reading coverage and passing. Defensemen are not in fact interchangeable in these roles if the goal is to get the most from each player’s unique talents. Generating offense is heavily reliant upon the defense. The manner in which the team exits the defensive zone has a huge impact upon whether or not they gain the offensive zone. Using the better passing defenseman as the drop back defenseman in the 1-3-1 gives the team an edge in turning the play in the opposite direction.